Download a handout of this web page here. Moose (alces alces) are indigenous to the northern hemisphere and reside primarily in Canada, the state of Alaska in the U.S., Scandinavian countries, most of Russia, and northern China. 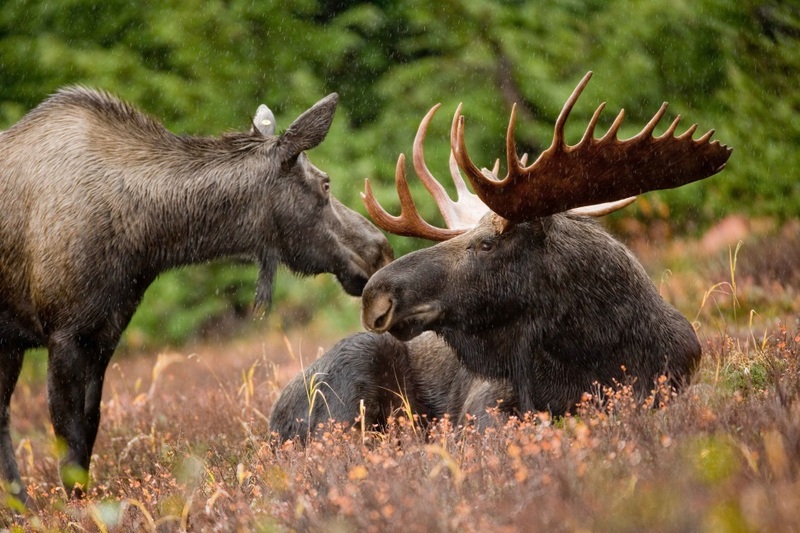 Within Canada, moose inhabit every province and territory making them one of the country’s most widespread species. As such, road users across Canada all have the potential to encounter a moose at some point in their travels. Gaining a better understanding of the moose, its characteristics, and habitat can help reduce the potential for unpleasant interactions between moose and road users. With the exception of man, there are very few predators that are able to kill full grown moose. Young calves and smaller or injured moose are at greater risk of being singled out by potential predators, but the adult moose is typically large enough to defend itself and inflict significant damage on other animals. Nonetheless, wolves and bears tend to be the primary predators of moose and, either through numbers (wolf packs) or large size (grizzly bears), they have the ability to take down adult moose. Moose can also be subject to disease and other illnesses. Moose mate during the fall months of September and October, referred to as the rut season. This means that large males are more aggressive, very active, and moving around during these periods. Among females, the gestation period is usually eight months and results in a single calf or two calves, referred to as young moose, the following spring. Newborn calves are very vulnerable and rely on the mother to protect and nourish them. 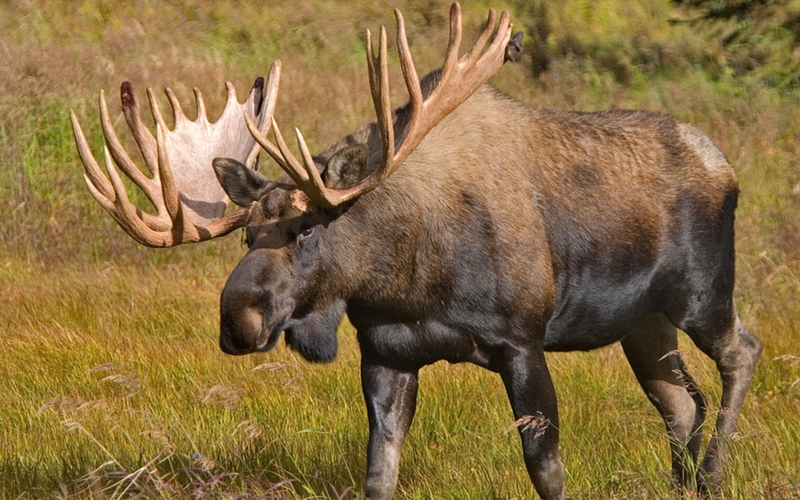 In contrast to deer, elk, or caribou moose are solitary animals and do not usually travel in herds. Moose often drink water next to roads that contain salt from previous winter road de-icing. Due to their long legs, the bulk of moose body weight sits high. They are tall, up to two metres high. Moose can run up to 55 km/h. Male moose shed and grow new antlers every year. 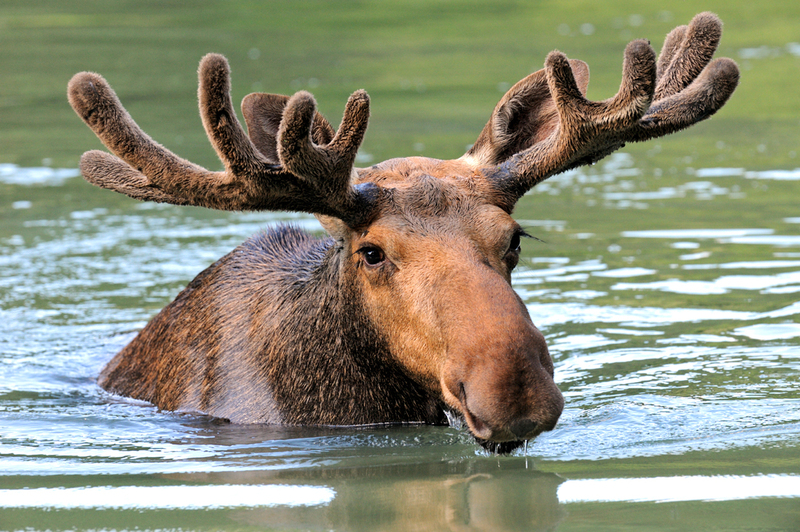 Moose are excellent swimmers and can dive under water. Moose do not travel in herds. It is against the law to touch, entice, disturb, or otherwise harass any wild animals in Canada’s National Parks. Moose are one of several species within the deer family and their scientific name is Alces alces. Within the broader animal kingdom, they are part of the large ungulate mammal group otherwise known as the “hoofed animals” due to their large divided hooves. In Canada, an adult male can weigh between 450 to 600 kg, while a female can weigh between 340 and 420 kg. Moose have an average life span of 15 to 25 years. Physically, moose have long legs and adult bulls in Canada typically reach heights of just under two metres high. As such, their centre of gravity, i.e., the bulk of their weight, is positioned high off of the ground. Males, or ‘bulls’, are known for their large antlers. These can span as much as 180 cm, but the average length is between 120 and 150 cm. In contrast, females referred to as ‘cows’ do not grow antlers. Males shed their antlers every winter after the mating season and a new, slightly larger set grows back during the spring and summer periods. Antlers can weigh up to 20 kg. Another identifiable characteristic of the moose is a piece of fur, referred to as the bell, which hangs below the neck. Moose have very poor eyesight and must roll their eyes forward in order to see objects in front of them; however, they have good hearing and sense of smell. Moose are covered in fur ranging in colour from dark brown to near black, which serves as important protection during cold winter months. There are between 500,000 and 1,000,000 moose across Canada. Although moose inhabit all Canadian provinces and territories, they are not native to Newfoundland. A handful of moose were introduced to the island in the late 1800s and the population has grown since. Generally speaking, moose are more commonly found on the hillsides of the Rocky Mountains of Western Canada, near lakes, muskegs, and streams or along similar habitats across other areas of the country. They are also found in the northern tundra regions and are spreading into new areas in Quebec, Ontario, and the Prairie Provinces. Moose are excellent swimmers and can swim up to 10 km/h. They can feed on underwater plant life and are able to dive to depths of over five metres to reach food. Moose also use swimming as a means to cool themselves during hot days and to rid themselves of insects. On land, these large animals can reach up to speeds of 55 km/h over short distances. In North America, the term “moose” originated from the Algonquin word mooswa, which translates as “eater of twigs”. For sustenance, the moose’s diet changes from summer to winter but consists largely of various forms of plants. During the summer, moose eat leaves, grass, and water vegetation when available, while in the winter they must rely almost exclusively on various types of twigs and shrubs for food (e.g., balsam fir, birch, willow, and maple trees among others). Additionally, in the spring it is not uncommon to find moose drinking water alongside roadways or in ditches in some areas of Canada where salt has been used to de-ice winter roads. This is because during the winter moose do not ingest enough sodium and will make up for this by drinking water where melted snow and salt have pooled. Grosman, P.D., et al. (2011). Trade-off between road avoidance and attraction by roadside salt pools in moose: An agent-based model to assess measures for reducing moose-vehicle collisions. Ecological Modelling, 222(8), 1423-1435.